Public Forum – DISARM THE COPS! 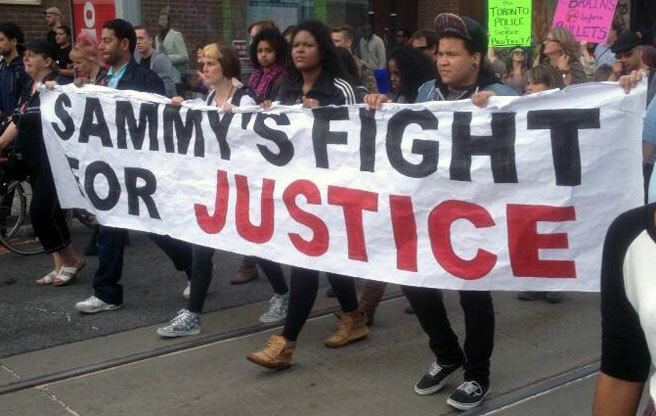 The July 27 police killing of 18-year old Sammy Yatim, another in a long string of unarmed victims shot to death by Toronto cops, raises questions: What is the root cause of these murders, often of immigrant, working class, and visible minority youths? Should street patrol cops be disarmed? Can police in capitalist society ever be held accountable to the majority? Whose interests are served by the cops, the courts, the military and the entire capitalist state apparatus? What should youths, racialized minorities and working people do about this? Join us for a panel of speakers, followed by an open discussion. Tyler Mackinnon, YSA chairperson, Ryerson U. student, recently returned from Greece where he visited a ‘cops-free’ neighborhood in central Athens. Ben Rostoker, YSA secretary-treasurer and U of Toronto student activist. Wangui Kimari is an organizer with the Network for Pan-African Solidarity and the Network for the Elimination of Police Violence. An open Q & A, and discussion period will follow the presentations. Thursday, August 29 7 p.m.
Everyone is welcome. $2 donation requested, or PWYC.